The chart demonstrates the total return on a stock accounting for changes in price as well as dividend payments. The formula also accounts for stock splits. 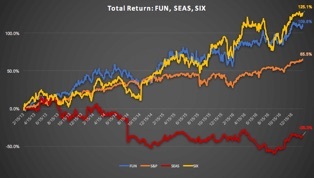 FUN and SIX have both outperformed the S&P average, while SEAS has gone backward beginning in mid 2013. But the fallout from Blackfish is not the only cause for concern among investors. SEAS carries more debt than both FUN and SIX. It also spends a lot more in CAPEX than its peers. The impact of Blackfish certainly impacted revenue, but the Sea World parks have historically had significantly higher CAPEX and OPEX levels than their peers. Retooling its image will drive CAPEX higher not lower. This implies that Sea World’s management will have a lot less cash to distribute to shareholders through dividend payments and stock repurchases. SEAS’s current stock price of $18.94 is well above what its current earnings and CAPEX requirements can support. Perhaps its investors perceive there to be a lot of unrealized upside. Perhaps. But that upside, if it is to be realized, will be realized in a future too distant for this investor. In the interest of full disclosure, the author does own both FUN and SIX stock.